As of the hot weather thought I would share this icy bundle of AWESOMENESS! Take individual fruits and blend with a little water to make a paste. Take your mould then simply layer each fruit on-top of each other and leave in a freezer for an hour. BOOOOM !!! 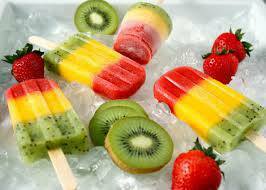 I hope you get some Vitamin D & Enjoy your healthy ice lollies this weekend!